Good warm up, threw my Easton Carbon wheels on and we hit the start from mile one someone throws down a HUGE excelaration and there are 3 guys off the front, Wines, Hagens and Carter. So starts the 48 mile chase. We were miving pretty well and Dustin, Tony and I sppent most of the race near the front each of us trying to bridge atleast twice. On my second bridge attempt on lap 3 I felt my quads tighten and I knew with 2 more to go the game was over. I tried to spin it out, even unclipped and stretched them during a lull but it was just too late. Lap 4 was amazingly fast and I was having a hard time staying on, not because I felt like I couldn’t recover but because my quads and my hamstrings were so cramped everytime I stood I immediately had to sit because they were locking up. I was dropped on the two rollers going into the final lap. My solo ride to the finish line hurt so bad. Brad 1st! Jeff L 2nd! Pictures, click to enlarge (I’ll have more posted at my Flickr site soon) Thanks to Ro for her awesome footage and cheerleading! Brian, making Tom Wick hurt but what is Dustin smiling at? 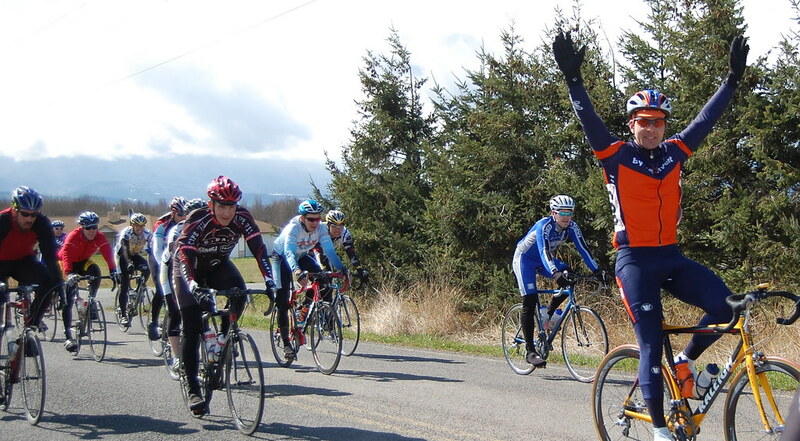 Brad with the win in the Cat 4’s… Nice job! 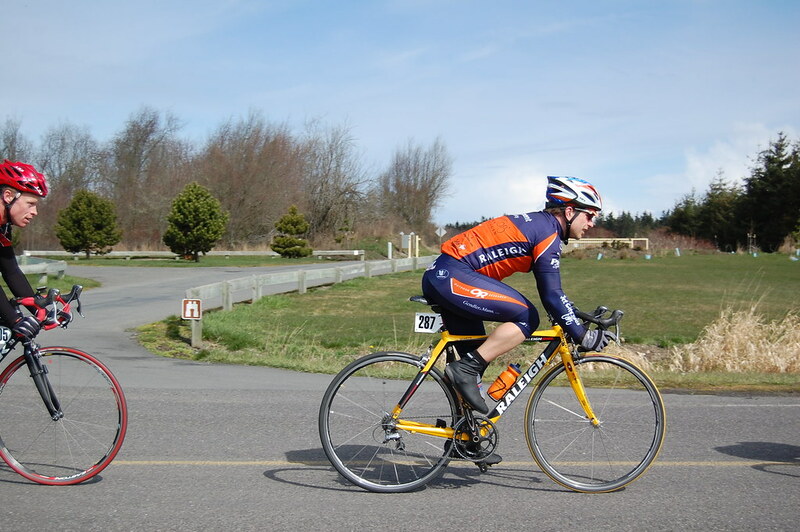 So, tomorrow Jeff D, Dustin and I are heading down south for the POC Road Race and dabble in some Oregonian pain. Too many “sport leg pills” for your “sport legs,” eh? Maybe if you had 5 legs, then 5 pills would’ve been OK? ohhhh…..tough start to the day! We remarked about the Sequim PoPo Saturday night, wondering what they could possibly have to do in this town. I guess you answered that. Aw crap… I didn’t know you came off at the end. Too bad. But you guys are killing it! It’s fantastic to see the BI 3s race so well together.